The Noto Peninsula on the Japan Sea coast of Ishikawa Prefecture offers some of the most beautiful and unspoiled scenery Japan has to offer. Home to Japan's finest seafood production, the peninsula is known for its breathtaking coastline and its abundant nature. There are pristine landscapes and picturesque, beautifully-preserved small villages to explore. Cycling around the Noto Peninsula is a unique experience, on mainly flat coastal routes and also some peaceful mountain roads, to enjoy the serene atmosphere of this lovely area. 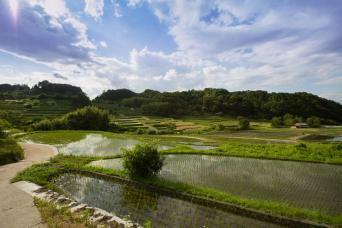 Cycle at your own pace past terraced rice fields, spectacular rock formations, and engaging fishing ports. On this 5 day tour you'll experience the real Japan in so many ways - seeing beautiful places, meeting local people, staying in lovely lodgings, including hot-spring Ryokan inns, and delighting in the friendliest of welcomes. There is no better way to learn about local community lifestyles in Japan and to gain an in-depth understanding of regional culture than to sample the local cuisine. And there is no better way to finish a day's cycling day than savouring the traditional dishes made from the freshest and tastiest local ingredients at your inn, while you dream about what tomorrow’s cycle ride will bring. Please ask for information about tour extensions to the mountain-top temple town of Mount Koya with its monastery lodgings or the peaceful, agricultural community of Asuka at a charming Japanese inn or with a local family for a unique homestay experience. Read about luggage options here. Takkyubin Courier is ideal for our self-guided cycling tours, as well as self-guided walking trips. The day before your tour begins, meet an Oku Japan team member in central Kyoto for an orientation session to receive your handy folding bike and other gear for your journey. You are welcome to use the bike for the rest of the day in Kyoto. On Day 1 of the tour, travel by train to Houdatsu on the Noto Peninsula and begin today's ride here at the station. Discover the unique Chirihama Driveway. A portion of the route travels on hard-packed beach sand. On your journey you will pass beaches and follow country lanes past rice fields, charming rural villages and rugged coastline. Visit Keta Taisha Shrine whose sacred power was regarded as having great national importance by the old central government. 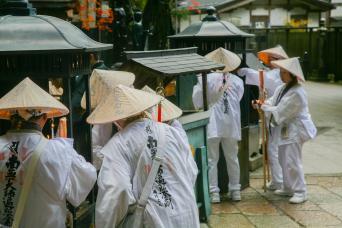 Nearby is atmospheric Myojoji Temple, another historically significant spot. Just before arriving in Togi, your destination for tonight, there are particularly lovely coastal stretches with unique rock formations. Spend the night at a family-run Minshuku in Togi with delicious home-cooked meals, or at a comfortable local western-style hotel. A shorter option is available by using local trains. In the morning cycle along more scenic coastal lanes through small villages. Leaving the coast, the road passes through mountains to today's destination, Wajima - a charming port-town producing some of the finest lacquerware in Japan. En route, you can stop at the famous Sekinohana, a dynamic rock formation created by waves. Visit Soujiji Temple, one of the two head temples of the Soto school of Zen Buddhism. Your accommodation tonight is a charming traditional Minshuku. Wajima port is renowned for the quality of its fish and tonight's dinner will be an outstanding multi-course seafood feast. A shorter option is available by using a taxi transfer. Enjoy a lovely coastal road to Shiroyone Senmaida, a hillside of two thousand terraced rice fields overlooking the Japan Sea. A pleasant flat road beside the sea has scenic views and continues for about 30km /19 miles past the old houses of Tokikunike and sea salt farms. After some hilly ascents and descents, the route heads into peaceful mountain scenery and today's destination - Suzushi - on the other side of the Noto Peninsula. Suzushi has a delightful atmosphere and is famous for its landmark Mitsukejima Rock. Short options are available by using local bus. After breakfast, your longest day on the Noto Peninsula is from Suzushi to Notojima Island in Nanao Bay. A half-hour taxi ride from Suzushi brings you to Ogi fishing village. There are old fishermen's houses on the small streets and it is a perfect area for gentle exploring. There's a real sense of early twentieth century Japan here! Today's cycling starts from Ogi along a mostly flat, pleasant coastal road through small hamlets towards Notojima Island. After riding along the coast for 50km/31 miles, come to Anamizu railway station and board a train for the brief ride to Nishigishi. From Nishigishi you cycle over the bridge to reach Notojima Island itself where you'll receive a warm welcome at your final inn. A shorter option is available by using an additional taxi journey. After breakfast, wave goodbye to your hosts and cycle your final leg of the tour to Wakura Onsen. Wakura Onsen is a famous Onsen hot-spring resort on Nanao Bay and has 1,200 years of history. The town is dominated by large hotels and a whole range of Ryokan. You are free to explore Wakura before heading onwards by train via Kanazawa to Kyoto where our tour ends. Why not visit one of the hot-spring inns as a day visitor before contining on to Kyoto? In Kyoto, an Oku Japan team member will meet you to retrieve your bike and other rental equipment. We can happily arrange onward train tickets to your next destination for a supplement if you wish.